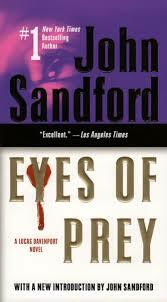 Blurb: John Sandford’s acclaimed Prey novels have taken readers into the minds of murderers and manhunters. Now his brilliant detective, Lucas Davenport, faces an equally brilliant – and elusive – opponent. A madman who becomes obsessed with a beautiful woman – and carves her initials into the flesh of his victims. Review: It had been over a year since the last time I picked up a Lucas Davenport novel, so I was excited to jump back in with Lucas … especially since I had so enjoyed the previous installment. I was most definitely looking forward to the 6th book. And this one did not disappoint! This is one twisted and crazy read. It was gruesome and violent. But I still thoroughly enjoyed it! Mr. Sandford definitely comes up with some creepy and clever killers for Lucas to have to hunt down. I really enjoyed the addition of Meagan’s character, even though I knew she wouldn’t be a long-lasting one (she was dying of cancer). It was interesting to see Lucas work with a female “partner” on this case. I am generally a huge supporter of reading series books in order (I’m actually kind of fanatical about it…) but I really think this book would read well as a standalone if needed. Either way, I definitely would recommend picking up this backlist book if you are looking for a fast paced thriller. Thoughts: This is the first in the White House Chef Mystery series …. it was a fun read that I enjoyed! It was cute, but not cutesie …. if that makes sense? I definitely am looking forward to reading the next book in the series! Thoughts: So this one I found in the bargain bin at Barnes & Noble. I had my eye on it when it first came out because I had read and LOVED her previous book, Reconstructing Amelia, so I think I had high hopes for this one. I enjoyed it, but it didn’t grab me right off the bat and I struggled to really get into it. And when it was all revealed in the end, it wasn’t as surprising as I had hoped for. So good, but not great. Thoughts: This is the 3rd book in the Nina Reilly series. I have read and enjoyed the previous two so I was looking forward to this one! I enjoyed it and it definitely left me wanting to read the fourth book … if only they weren’t so long, I often find myself too intimidated by longer books these days…. Thoughts: This is the 5th book in the Kate Burkholder series. I read and LOVED the first 4 in 2016 and had tried to pick this one up shortly after I read the 5th, but realized that I was a little burned out on the series. In fact, I can recall feeling like the books were all too similar to each other. So I set it aside and decided I’d come back to it later. Apparently a year later I decided it was time …. I’m glad I waited because I thoroughly enjoyed it! I had no trouble jumping right back into Kate’s life and I can’t wait to see where her and Tomasetti go in the future. I definitely recommend this series! Thoughts: I read the first book in this series, Eeny Meeny, back in January of this year and I absolutely adored it! So I had high hopes for this one, but I wanted to let it sit for awhile (series burnout is real!) … and while I did enjoy this one, it definitely didn’t grab me as fast as the first book did. It was gruesome and a roller coaster ride, but I felt like it was a letdown from the first book. Yet I still want to continue on with this series, so it wasn’t terrible either. A solid thriller. Thoughts: This book was October’s selection for Barnes & Noble’s Serial Reads…. I don’t read a lot of romantic suspense, mainly because I don’t read a lot of romance. So I was a little unsure going into this one, but I was immediately intrigued by the storyline – the missing person’s case. If only it had been a little more on the intrigue and less on the romance (which really, wasn’t overbearing honestly…) it would have been a lot more interesting to me. So not something I would ever pick up on my own, but definitely a decent freebie read. Thoughts: I remember very clearly thoroughly loving the previous book in this series, Silent Prey, so I was looking forward to getting to this 5th book in the Lucas Davenport series. Why did I wait so long between books?!? I really enjoyed this book. It was so creepy and suspenseful. I know I’m only on the 5th book in the series, but other than #2 they’ve all been home runs for me! Definitely makes me look forward to continuing on sooner rather than later! I mean, seriously!! What a freaking book! This is the fourth in the Lucas Davenport and is kind of a sequel to the third, Eyes of Prey. I read that one a couple of years ago and remember loving it. So why on earth did I wait so long to pick this one up?! I can’t answer that, but I sure am glad I read it now! The blurb above doesn’t really do justice to the book. It doesn’t mention that there’s actually a dual storyline. The one with Bekker – who escapes and makes his way to New York City. And then the one where Lucas goes to New York in order to surreptitiously hunt down the “Robin Hoods” (vigilantes killing criminals in NYC) under the auspices of the Bekker case. I personally enjoyed both storylines – they were both interesting. So yeah, there’s not much I can say about this book except that I loved it! And I’m looking forward to continuing on with Lucas Davenport! Blurb: Lieutenant Davenport’s sanity was nearly shattered by two murder investigations. Now he faces something worse … Two killers. One hideously scarred. The other strikingly handsome, a master manipulator fascinated with all aspects of death. The dark mirror of Davenport’s soul … This is the case that will bring Davenport back to life. Or push him over the edge. Review: This is the 3rd book in the Lucas Davenport series. After loving the first book, Rules of Prey, I was excited to get into the second one, Shadow Prey. Unfortunately Shadow didn’t really work for me, so I was a little apprehensive to pick up the next one. I loved this book! Bekker is one creepy dude! And the ending … well, I don’t want to say too much, but I have a feeling that Bekker could possibly turn up in a future book! And whew, would that be interesting!! I liked Lucas a lot better in this particular installment than I did in Shadow. My issue with that book was the womanizing … when he had a newborn and a woman he kept trying to propose marriage to. In this installment, he’s come back down to reality. He’s obviously spent some time in a serious depression. And this case somewhat snaps him out of it. I liked that we got to see Lucas a little bit vulnerable. And then we get to see him pulling himself back up and getting back on the right track. Overall, I thoroughly enjoyed this book. And I would highly recommend it. I think this series is just one that might be hit or miss. All series are like that to a point, some books are better than others. This particular book is better than the second in the series. But I’m definitely looking forward to getting to the fourth book. And I’m kicking myself for letting the movers pack it up with all my other books! Boo! Never get involved with a cop: Lieutenant Lucas Davenport has been warning women for years, but now he finds himself on dangerous ground with a policewoman named Lily Rothenburg, on assignment from New York to help investigate the murders. Both have previous commitments, but neither can stop, and as their affair grows more intense, so too does the mayhem surrounding them, until the combined passion and violence threaten to spin out of control and engulf them both. Together, Lucas and Lily must stalk the drugged-out, desperate world of the city’s meanest streets to flush out Shadow Love — not knowing they are now the objects of his deadliest desires…. Review: This is the second book in the Lucas Davenport series. 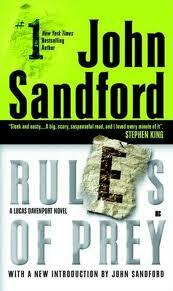 Last year I read and reviewed the first book, Rules of Prey. I gushed and gushed about how wonderful that book was. For whatever reason, I never picked this one up (and it’s been sitting on my shelves for a long time). Unfortunately … this one wasn’t as great as the first book. I wouldn’t necessarily say that it was terrible, but it definitely wasn’t wonderful. I had a really hard time getting into the actual storyline. And that really made it difficult to push through. But I never thought about abandoning it, I was going to finish it (even if it did take me forever…). I also had a problem with Lucas’ womanizing in this installment. I knew that Lucas was a womanizer after reading the first book, but it was really bad this time around. I suppose it’s because he has a new baby girl, Sarah, with Jennifer and he had supposedly offered marriage numerous times to her (she keeps denying him), and yet he hops into bed almost immediately with his partner from New York. And he pretty much tells Lily and Jennifer that he just can’t help it. I don’t know, it bothered me. It just didn’t ring true to me. Overall, I’m not going to be giving up on this series just yet. Mr. Sandford’s writing is really good. I think I just really had a problem with the storyline in this one. It just didn’t work for me. Not a bad book, but not one I would highly recommend. Blurb: The killer was mad but brilliant. He left notes with every woman he killed. Rules of murder: Never have a motive. Never follow a discernible pattern. Never carry a weapon after it has been used… So many rules to his sick, violent games of death. Review: Looking back, I realized that I have only read two books in this series – both of them more recent installments. And now that I have read the first book in the series all I can do is shake my head and wonder what is the matter with me? I loved this book. Like, love love loved. Seriously. Since having Garrett in May it’s been hard for me to get any kind of rhythm back into my reading. I’ve been reading what I’ve had to read by deadlines I’ve agreed to. But other than that, reading books off of my shelves has been a little hit or miss lately. But this book – this book definitely broke me out of that cycle! I simply couldn’t put it down. When Garrett would take his nap I would pick this book up (when I should have been doing laundry, dishes, work, etc.) and would be upset when he woke up again. Because I wanted to keep reading! I just have to say that Lucas Davenport is a badass cop. He pretty much does what he wants when he wants to. Some of the things he did in this book, well they would be a little outside the normal boundaries. But I think that that’s what made this book feel so much more real to me. Davenport isn’t necessarily a play-by-the-rules kind of guy. He’s killed five (six?!) men in the line of duty – most cops never even pull their guns. And he didn’t have any remorse about doing what had to be done in order to catch the maddog – even if it was a little outside the lines of legal. Now I will state that this book was originally released in 1989 – that means that things were a little dated. And seriously – who uses the word prophylactic? I had never even heard that term before! They’re condoms, people! And it wasn’t used just once – no, it was used throughout the entire book. So much so that it was a little overboard at times. Obviously there were no cell phones, no internet, no widespread computer use. (Can you imagine how hard police work must have been before the age of computers?!) It definitely ages the book, but I honestly didn’t even notice most of the time because the writing and storyline were that good. Overall I want to hit myself upside the head for waiting so long to read this book. I have had it on my shelf since 2007 (and I know that because I actually remember buying it at the grocery story when I was first married). I can’t say enough good things about this book. If you have somehow missed this book, I highly recommend hunting down a copy and giving it a shot. Blurb: Lucas Davenport has seen many terrible murder scenes. This is one of the worst. In the Minnesota town of Wayzata, an entire family has been killed – husband, wife, two kids, dogs. One the wall, in blood: “Were coming.” No apostrophe. There’s something about the scene that tugs at Lucas’s cop instincts – it looks an awful lot like the kind of scorched-earth retribution he’s seen from Mexican drug gangs. But this is a seriously upscale town, the husband ran a modest software company, the wife dabbled in local politics. None of it seems to fit. Until it does. And that’s when everybody starts coming to town: the DEA, the Mexican federales, and some independent operators who are decidedly less welcome. Where it all leads … will take Lucas into the darkest nightmare of his life. Review: I received this book through LibraryThing’s Early Reviewer program. It has a publication date of May 15, 2012. I honestly haven’t read very many of the Lucas Davenport books (even though I have quite a few of them accumulated on my shelves), but I was really excited to see this one offered on LibraryThing’s Early Reviewer program. And then I was thrilled when I saw that I had managed to snag a copy. But at the same time, I was a little apprehensive. It’s the 22nd book in a series. A series in which I’ve read maybe two previous books. But it worked out fine. This book can read as a standalone. I had very little idea as to who the characters he mentioned really were (his wife and daughter, namely), but that didn’t take away from the book whatsoever. The plotline revolved around Mexican drug dealers, money laundering, murderers, bank fraud. Oh yeah, and murder. It all made it seem very current to today’s world. It was made very interesting when someone ended up being not who they appeared to be. Overall, I found this book to be very fast paced and enjoyable. I would highly recommend it to anyone who loves a good thriller. First Line: An anonymous van, some-kind-of-pale, cruised Summit Avenue, windows dark with the coming night. When two elderly women are murdered in a wealthy Minneapolis neighborhood, it looks like a random robbery gone wrong with nothing of real value being stolen. But when Lucas Davenport begins to probe the murder he realizes that this was not only not random but things of major value were stolen. As he continues investigating, he sees a pattern emerge and one can only wonder what path it will lead him down…. This book was really, super good! I really enjoyed it. It is fast paced and enjoyable. You know who the killers are early on in the book but it’s an enjoyable ride trying to figure out how Lucas is going to pull it all together. Highly recommended.